The children of Joseph Smith Jr., the founder of the Latter Day Saint movement, and his wife Emma Smith, are historically significant because of their roles in establishing and leading the Latter Day Saint Movement, which includes The Church of Jesus Christ of Latter-day Saints (LDS Church), the Reorganized Church of Jesus Christ of Latter Day Saints (RLDS Church, now called Community of Christ), The Church of Jesus Christ (Bickertonite), the Church of Christ (Temple Lot) and several other sects. Several Latter Day Saint sects, including the RLDS, believed that leadership of the church would flow through lineal succession of Smith's descendants. 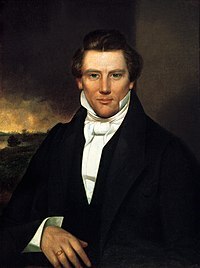 In 1860, Joseph Smith III became its prophet and president of the RLDS Church, although they no longer adhere to this practice. The larger LDS Church did not follow that practice, and it was led after Joseph Smith's death by Brigham Young. Joseph Smith Murdock* April 30, 1831 – March 29, 1832 (age 10 months) *Adopted. Twin of Julia, birth son of Julia Clapp Murdock and John Murdock who upon his wife's death in childbirth gave the infants to the Smiths for adoption. Died from exposure (many accounts say pneumonia) following a mob attack on the Smith home on the night of March 24, 1832. Frederick Granger Williams Smith (1836-06-20)June 20, 1836 – April 13, 1862(1862-04-13) (aged 25) Frederick married Anna Marie Jones on November 13, 1857. On November 27, 1858, a daughter, Alice Fredericka Smith, was born in Nauvoo. Alice never had any children. ^ Ugo A. Perego, Natalie M. Myers, and Scott R. Woodward, “Reconstructing the Y-Chromosome of Joseph Smith Jr.: Genealogical Applications, Journal of Mormon History Vol. 32, No. 2 (Summer 2005) 70-88. ^ "Research focuses on Smith family". Deseret News. 2005-05-28. ^ "DNA tests rule out 2 as Smith descendants: Scientific advances prove no genetic link". Deseret News. 2007-11-10. ^ a b c Jones, Gracia (June 10, 2009). "Emma's Lost Infants". The Joseph Smith Jr. and Emma Hale Smith Historical Society. Retrieved January 3, 2012. ^ Jones, Gracia (December 11, 2009). "Children of Joseph and Emma: Frederick Granger Williams Smith". The Joseph Smith Jr. and Emma Hale Smith Historical Society. Retrieved October 3, 2011. This page was last edited on 22 February 2019, at 23:38 (UTC).